﻿ HuntingNut » Forums » Firearms, Shooting & Reloading » Reloading Ammunition » Ooops! Posted: Thu Nov 03, 2016 1:59 pm Post subject: Ooops! Last Saturday I was shooting my 9mm carbine using a batch (500) of reloads I'd made a while back. I had a failure to fire so, after about 30 seconds, I pulled the bolt back, muzzle down, and nothing ejected. A quick glance didn't see anything in the chamber so I released the bolt to feed another round, thinking that for some reason the magazine didn't feed right. It is a new magazine, in a gun I've only shot one other time. Then the bolt failed to close. I dropped the magazine, retracted the bolt, muzzle up, and two rounds fell out. After looking at the primers (no strike) I dropped them in my pocket. I was done for the day anyway. When I got home later this is what I found. 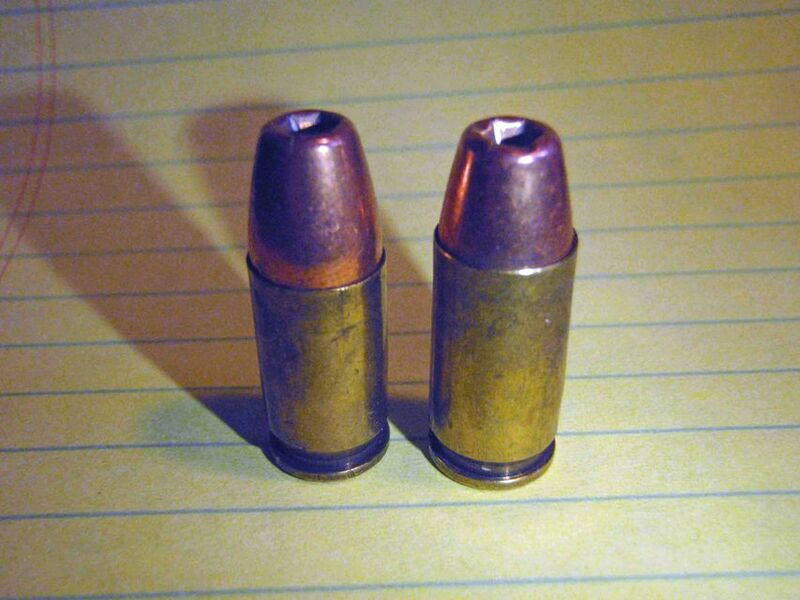 The round on the left was the first "misfire" and the one on the right was the second. As you can see the case on the left is a little short. Well, for a 9x19 anyway as it happened to be a .380. It slide far enough into the chamber that the firing pin never reached it. Also my quick glance didn't see it in there. Posted: Thu Nov 03, 2016 3:30 pm Post subject: Re: Ooops! Pkslinger, thanks for passing on the lesson learned. Posted: Thu Nov 03, 2016 9:20 pm Post subject: Re: Ooops! You are very lucky mate...that had the potential to be a nasty mistake. Posted: Fri Nov 04, 2016 10:04 am Post subject: Re: Ooops! Hangfire in your shorts = no giblets!!! FTF = drop mag, cycle bolt several times, inspect chamber with bolt out. Find the REASON for the FTF first before attempting to fire again. Glad ya didn't get a KB on the short 9. Or a short 9 KB in the shorts! Seen guys at the range mix 9mm and 40, the extractor holds the round and they do go bang. That can = a busted chamber. Seen a 9mm dribble through the pipe in a 45 ACP and hit the ground during "make ready". The stage was halted. NO ONE MOVE! Gun was passed to RO. Mags and stuff inspected. He had two more mags with mixed rounds! 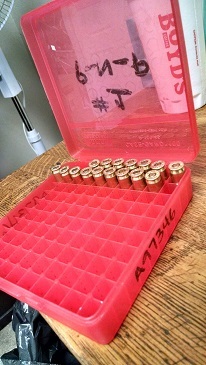 Tip- I used to put my reloads in a bag or box....now I use MTM flip-top boxes. That way I am 100% sure of what I'm sticking in the mag as they are double-checked after loading for high primers and again before insertion into a magazine! If you use coated bullets, use different colors for different calibers. Posted: Fri Nov 04, 2016 10:30 am Post subject: Re: Ooops! Stovey, thanks for your concern but it was several minutes between the time I ejected the rounds and when I put them in my pocket. I realize that that wasn't clear in the original post. Also neither primer had been touched. As I was in a hurry to leave (had to pick up the wife) I wanted to be sure to segregate those two rounds until I had time to check them out. Posted: Fri Nov 04, 2016 10:33 am Post subject: Re: Ooops! Copy that...just saying for the benefit of others....yer good, not a chop man! Posted: Fri Nov 04, 2016 2:50 pm Post subject: Re: Ooops! ... If you use coated bullets, use different colors for different calibers. That is a brilliant idea mate. Another idea I use to identify different weight projectiles in the same calibre is to use different colour Sharpies to mark the primers for different weights. I handload all of the same weight at the same time and box them...makes it easy to go through and mark all the primers at once, then I move on to the next load. For arguments sake, I use BLUE for one weight, RED for another and GREEN for another. This is a visual reminder when the rounds are in the MTM ammo box. Obviously I also store the different 'colours' together in the box if I have more than one load in the same box. One thing I never do is mix calibres in the same box. I don't even mix different 12g loads in the same ammo tin...one tin for 28 gram loads, another for 26 gram and my hunting loads are all in separate 25 round boxes according to what they are. Posted: Sat Nov 05, 2016 5:14 am Post subject: Re: Ooops! Posted: Sat Nov 05, 2016 9:15 pm Post subject: Re: Ooops! Didn't realise they were so similar. Been out of pistols too long. Posted: Sun Nov 06, 2016 1:43 am Post subject: Re: Ooops! Posted: Mon Nov 07, 2016 9:06 pm Post subject: Re: Ooops! glad to see you got out of pickle with all your bits still intact. Posted: Tue Nov 08, 2016 5:52 am Post subject: Re: Ooops! I'm thinking that,if the round had fired, it would have been OK. The extractor would have had to hold the case back against the bolt, so the distance of the bullet to the lands would have been the same. The "combustion chambers" are pretty much the same volume, depending on the vagaries of the case. I doubt I would have ever know the difference. That said, I still plan to be more careful in the future! Posted: Wed Nov 30, 2016 12:20 pm Post subject: Re: Ooops! Yeh- you'da been OK. Prolly felt a softer recoil....they are sorta close depending on the recipe. MAX PSI is around 13k different...doubt you'da even had a squib in the tube if it sealed ok.
Posted: Wed Nov 30, 2016 5:30 pm Post subject: Re: Ooops! Remember, this was in a batch of 9mm handloads. Same powder charge as the rest of them. Just the case was wrong.